I've known for a few years that Thailand experimented with simplified spelling during World War II, but I've never found much information about this little experiment. For example, what years it was in place, or just what changes were made. But nor have I looked very hard. I recall reading somewhere that the Japanese (who were occupying Thailand at the time) found Thai too complex, and wanted it simplified, but I don't know if that's the real reason. I understand that it was mandated by Field Marshal Plaek Phibunsongkhram, and even people's names had to be respelled under this system. One remnant legacy of this is that famous name in dictionaries, So Sethaputra, whose last name is spelled เสถบุตร to this day. The original spelling of his last name is เศรษฐบุตร, but since his name became famous along with his first dictionary under its revised spelling, he was one of the few that didn't revert the spelling after Field Marshal Plaek was ousted. All of วรรค ฎ (i.e. ฎ ฏ ฐ ฑ ฒ ณ), the section of the alphabet corresponding to the Indic retroflex consonants, is gone, being replaced by their corresponding consonants in วรรค ด (ด ต ถ ท ธ น). ใ is uniformly replaced with ไ. ญ is replaced with ย in initial position (e.g. 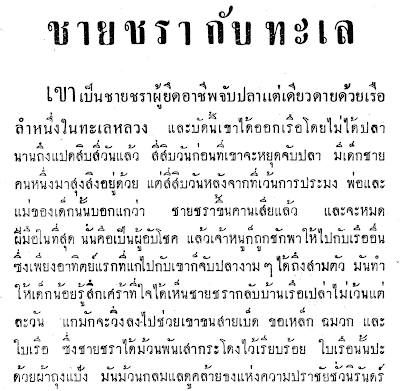 ใหญ่ > ไหย่), but retained in final position without its 'base' (ฐาน), as seen on the title page in the word สามัญ. Of the three high /s/ consonants, ศ ษ ส, only ส is retained (e.g. ศึกษา > สึกสา). Initial /s/ cluster ทร is replaced by ซ (e.g. กระทรวง > กะซวง). The leading อ in the four words อยาก อย่า อย่าง อยู่ is replaced by ห. Many consonants that don't add to the pronunciation are eliminated (e.g. จริง > จิง, ศาสตร์ > สาตร). Some clusters are reduced (e.g. กระทรวง > กะซวง). The book is divided up into 15 chapters, covering such topics as 'The Sun is a Large Ball of Fire', 'Water Becomes Steam', 'The Earth is Round' and 'Night and Day'. This seems to be a stretched definition of ภูมิสาตร 'geography', to the point that I checked a 1933 dictionary to see if the word could have been used in a broader sense meaning something like 'physical science', but not apparently not. It's just not a very good classification of the contents, since it's a language reader, after all, not a science textbook. I've only included the image of the first page, but I've typed up chapter 1, which is three pages long. As above, simplified spellings are in red, and spellings that differ from modern spellings (but not because of this simplification) are in blue. 2 ไนทันไดนั้น พวกเด็กได้ยินเสียงครูร้องถามมาว่า "หย่างไรนักเรียน ร้อนจัดไปหรือ จึงไม่เล่นอะไร" เด็กจึงพากันตอบว่า "ยิ่งกว่าร้อนไปเสียอีกครับ พระอาทิจนี้ช่างเหมือนไฟจิง ๆ"
3 ครูจึงว่า "ก็อะไรเสียอีกเล่า พระอาทิจก็เป็นลูกไฟน่ะซี เปนลูกไฟดวงไหย่ทีเดียว" เด็กคนหนึ่งเอ่ยขึ้นว่า "ทำไมจึงไม่มีไครเอาน้ำไปดับเสียหนอ เราจะได้ออกไปเล่นฟุตบอลล์ได้บ้าง"
4 ครูตอบว่า "ดับเสียไม่ได้ ถ้าพระอาทิจดับเราก็ตายหมด" เด็กชายฝืดจึงถามว่า "จิงหรือครับ" ครูตอบ "จิงซิ เพราะว่าความสว่าง ความร้อนและชีวิตของเรา เกิดขึ้นได้เพราะพระอาทิจ ถ้าไม่มีพระอาทิจเราก็หยู่ไม่ได้ เราจะไม่ได้รับน้ำฝน เราจะไม่เห็นละอองไอน้ำลอยขึ้นสู่ท้องฟ้า เราจะไม่เห็นน้ำไนแม่น้ำลำธารไหล ต้นไม้และสัตว์จะตายหมด น้ำจะกลายเปนน้ำแขง โลกก็จะกลายเปนก้อนน้ำแขงไหย่ และถ้าเปนดังนั้นแล้ว ฉันเชื่อว่าคงไม่มีไครชอบ เว้นเสียแต่เด็กชายฝืดคนเดียวเท่านั้น"
I wondered about the spelling of อาทิตย์ as อาทิจ, whether it's a result of simplified spelling or just an archaism, but pre-WWII dictionaries I have spell it as we do today, so I marked it in red. It should be noted, of course, that this is an etymologically acceptable change. The sequences ตย and จ correspond, the former indicating Sanskrit origin, and the latter Pali. There are plenty of synonym pairs like สัจ and สัตย์, for example. 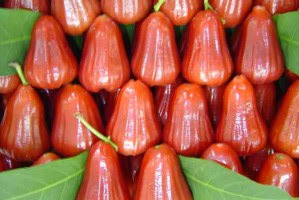 1 One day in the hot season, a group of children were lying around on the grass beneath a tamarind tree. That day was extremely hot, to the point that they couldn't play. The children were all complaining about one thing or another. There was only one boy who was contrary, who said that this was a fitting and comfortable time, because when it is very hot you don't have to do anything. 2 Just then, the children heard their teacher's voice call out, asking, "Hello students. Why aren't you playing? Is it too hot?" The children all replied "It's more than hot. It's like the sun is fire." 3 So the teacher said, "What do you expect? The sun is a ball of fire. It is a very large ball of fire." One child said, "Why doesn't someone take water and put it out. That way we could play some football." 4 The teacher answered, "You can't put it out. If you put the sun out, we would all die." Then the contrary boy asked, "Really?" The teacher answered, "Yes, really. Because light, heat and our lives can all exist because of the sun. If we didn't have the sun, we couldn't live. We wouldn't have rain. We wouldn't see steam floating up to the sky. We wouldn't see water in rivers and streams flow. The trees and animals would all die. Water would become ice. The world would become a large ball of ice. And if it were like that, I think no one would like it, except for one contrary boy." 5 Another child said, "The sun is a strange big ball of fire. It's very far from us, but it can still make us hot." The teacher said, "If our school burned down, you students would probably say it was a big fire." The students cried out together, "Of course!" The teacher then explained that if the whole city burned, it would be larger than the school fire many thousands of times over. But if the students would imagine that the whole world burned, and burned very bright, if you took this burning world and placed it next to the sun, it would be very small. A million times smaller. If the sun were the size of a football, or a monk's alms bowl, the world only would be the size of a green pea. The sun is an enormous star with light and heat that spreads its radiance all around it, and sends that radiance to very far distances." The students were all very amazed. The most interesting character in this story, to me, is the "contrary" child (เด็กฝืด), which more literally means something like "difficult". He's cast in a negative light, I think, which means the subtext of this story is to teach at least a couple things about contrariness: disagreeing with the crowd is bad (even when you're being an optimist--but then again, he was optimistic about getting to be lazy), and that contrary children deserve indirect criticism through exaggeration. I find it harsh (although amusing) that the teacher accused him of preferring the world be a cold dead rock just because the child asked, "Really?" There's more to be said about (and fun to had with) the story, but I'll leave it at that. Perhaps something interesting will strike you that I missed. 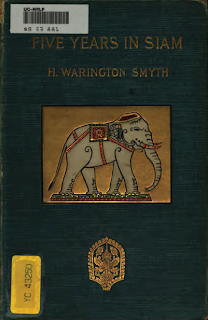 The Siam Sentinel has been posting a series of excerpts from H. Warington Smyth's book Five Years in Siam from 1891 to 1896, originally published in two volumes in 1898. 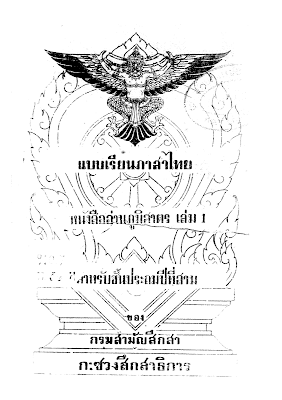 The title page of the book states that Smyth was once the director of Thailand's Department of Mines. From the sunset on to dawn the little isle lies a blaze of brightness in the great dark river; the crowded boats come and go into the ring of light, and the long-peaked yards of the fishermen stand inky against the glare. The deep bass of the monks intoning in the high-roofed Bawt swings across the water, with the subdued mirth and chatter of the never-ending stream of people circling round the pagoda. Volume one of this book can be downloaded from Google Books (within the United States). In fact, Google Books has four different versions of the first volume from various libraries, all of which can be downloaded, but no downloadable version of volume two. So it goes. 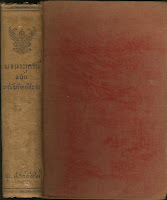 While obviously much has changed, one of the running themes that you'll notice in these posts is similarities between Siam of 1892 and Thailand of today. Well worth a visit. Take a look! Being new parents, my wife and I get to face new issues. One of the big ones is about language. When folks ask what language my wife and I speak at home, my typical response is to say that we speak Thai because it's the language of least resistance. Obviously, we'd like our daughter to speak both English and Thai natively. But I find myself so used to speaking Thai nearly all the time that I speak Thai with the baby, without thinking about it. It's a challenge. จ๊ะเอ๋ = 'peekaboo' A good all purpose expression for playing with infants, whether you're actually peeking and booing or not. ผ้าอ้อม = 'diaper' There's nothing ผ้า about disposable diapers these days, but that's what they're called. The more accurate name for this disposable variety is ผ้าอ้อมสำเร็จรูป. And with the help of stores like Tesco Lotus, Mamy Poko is quickly supplanting mommy dunk-o and scrub-o. There's also a generic colloquial term for disposable diapers, แพมเพอร์ส [แพ็มเพิด], from the brand name Pampers. My wife and I also use ไดเปอร์ [ไดเป้อ], but I haven't heard that elsewhere, although it gets a few hundred Google hits. I've never been big on new year's resolutions. And the only one I kinda sorta made this year didn't even occur to me until a week into 2008, so I don't know if it counts. The resolution was to post more regularly on this blog. So far I've been doing well. My last post was number 100, which means this is my 101st post. I feel like there should be some kind of celebration or contest or something. Alas, there's not. I started Thai 101 not quite ten months ago, so my posting average is about twice a week, which was my goal from the beginning. The subtitle of the blog has always been "Thoughts on Thai language, media, and culture", so I've branched out to include more media and culture beyond my (possibly unhealthy) obsession with the Thai language. And since the new year, the number of regular readers has increased quite a bit, which is nice. One of the best parts of blogging is the interaction with other people and their blogs. I welcome all comments and links and tips. If there were a way to send home baked cookies via email, I'd welcome those, too. I know the anarchic freedom of the blog format causes me to neglect certain features, and seemingly never finish some series I've started. I have a couple dozen posts hanging halfway written at any given moment, and I go back and finish one or another of them haphazardly. I'll try to wrap up loose ends. All said, I'm proud of making it into the triple digits. Thank you, everyone, for participating. Let's all keep at it. Obviously, wordcount isn't a good measure of dictionary quality. In Thai we don't see this as much. The notable exception that I've seen is Wit Thiengburanatham (วิทย์ เที่ยงบูรณธรรม), whose library-size Thai-English dictionary boasts on its front cover to contain more than 80,000 words. Anyone who has used this dictionary knows what a large percentage of these are flora and fauna names, which I would guess is what makes up most of the different. These words are certainly valuable to record, but it goes to show why having a huge count doesn't necessarily mean more words that will be useful to the average user. But even if wordcounts aren't a good gauge of overall quality, they can still be a (very rough) gauge of coverage. In 2005, during the early days of the project that became my senior thesis, I wanted to know how RID stacked up. Believe it or not, in this computer age, I counted the entries. I had no digital texts I could use, and since I watched a lot of TV anyway, whenever I found myself with downtime I'd count away, doing each letter of the alphabet separately, periodically jotting the number down on the corner of the page so I wouldn't lose my count. I kept a table on the flyleaf. I did one pass to count headwords (e.g. ใจ) and another pass to count subheads (e.g. ใจดี). Oh yeah, and did I mention I did this for the 1950, 1982 and 1999 editions? I know, it's embarrassing to admit, like saying I translated Harry Potter into Klingon. But lest you should mourn for my social life, I was engaged when I started and married by the time I finished. My wife thought I was crazy. Still does, most of the time. I also wonder. Nowadays, I have digital texts of RID82 and RID99 (although the latter has lots of missing entries). And though I could check my counts, I haven't. The percentage difference is sure to be small. Or maybe I'm just scared I'll discover that I don't know how to count as well as I thought I did. Its interesting to note that while there were significant gains in both headwords and subheads between RID50 and RID82, there were less than a thousand new headwords in RID99, but upwards of 5,000 subheads. The differences aren't just new words, though. There are lots of changes (large and small) to the definitions between editions, mostly in the direction of beefing them up and adding more senses. And even though the total number of heads and subheads in RID99 is less than half of what Dr. Wit's dictionary claims, this does not even begin to capture the number of senses in the dictionary, so it's difficult to compare the two. In the end, though, it's clear RID isn't anywhere near a complete record of the Thai language. It's probably a nearly complete record of Standard Thai, that mythical creature that is taught to all and spoken by none. Actual Thai is much harder to put in a book, much harder even to define. Contenders in the commercial sector like Matichon are helpful, because by taking the descriptive approach to lexicography, they're helping force the Royal Institute to come out of its prescriptive shell, as seen by last year's release of their Dictionary of New Words, Vol. 1 (พจนานุกรมคำใหม่ เล่ม ๑). That's a good thing, because unless they continue to adapt their methods, their dictionary will become obsolete. If they keep up the same pace of their last dictionary, the next edition of RID will be released in 2024. And if there are only a few thousand new words and compounds in it, people will wonder if the decades of work were worth the trouble. We're nearing the end of my translations of the frontmatter from RID99 (พจนานุกรม ฉบับราชบัณฑิตยสถาน พ.ศ. ๒๕๔๒). Etymology's on the agenda today. The original Thai for this section is here. There is actually more to translate in the dead tree version of the RID99, including a synopsis of the history of RID. But the electronic text of that extra stuff isn't included in the web version, which makes it a little harder to work with. Maybe I'll get around to translating that in the future, though. In this post I've tried something new: the blue text is direct quotes of full or partial entries from the dictionary, for easier scanning. Scattered individual Thai words are still black. 1. The origin of a word is given at the end of the entry for that word, as an abbreviation in parentheses e.g. สทึง [สะ-] น. แม่น้ำ, ใช้ว่า จทึง ฉทึง ชทึง ชรทึง สทิง หรือ สรทึง ก็มี. (ข. สทึง ว่า คลอง). or การะบุหนิง น. ดอกแก้ว. (ช). 2. Any word that is given as being from another language in fact does not correspond exactly with the source word, because the words from languages such as Pali, Sanskrit, or Khmer that are borrowed in Thai are usually either shortened, changed orthographically, or changed phonetically, e.g. ธมฺม (Pali) and ธรฺม (Sanskrit) correspond to Thai ธรรม; โปฺรส (Khmer) corresponds to Thai โปรด. In giving the etymology, sometimes the spelling in the original language is given as well, e.g. ธรรม has (ส. ธรฺม; ป. ธมฺม), or โปรด has (ข. โปฺรส), in order to compare the original spelling with the spelling used in Thai. For loanwords which are written very close to the original language, only the source language is given, e.g. กฏุก only gives (ป. ), and ศิขร only gives (ส.). If a word is both Pali and Sanskrit, then both languages are given, e.g. รจนา has (ป., ส.). If a word is partially Pali and partially Sanskrit, then the original spellings of both Pali and Sanskrit are given, e.g. ปราโมทย์ gives (ส. ปฺรโมทฺย; ป. ปาโมชฺช). If the spelling is Pali, but is very similar to Sanskrit, e.g. หทัย, then it is given as (ป.; ส. หฺฤทย), or if the spelling is Sanskrit but very similar to Pali, e.g. สตัมภ์, then it is given as (ส. สฺตมฺภ, สฺตมฺพ; ป. ถมฺภ). 3. Any word for which the language of origin is uncertain, but is written similarly to another language, it is given is parentheses to compare with this language or that language, e.g. กำปั่น น. เรือเดินทะเลขนาดใหญ่ชนิดหนึ่ง... (เทียบมลายู หรือฮินดูสตานี ว่า capel). 4. Some archaic words are written one way, but nowadays the spelling has changed, in which case both the archaic and the modern spelling may be included, e.g. วงษ์ (โบ) น. วงศ์. วงศ- and วงศ์ [วงสะ-, วง] น. เชื้อสาย, เหล่ากอ, ตระกูล. (ส. วํศ; ป. วํส). Or only the modern spelling may have an entry, and the archaic spelling is given in parentheses at the end of the definition, e.g. กำสรวล [–สวน] (แบบ) ก. โศกเศร้า, คร่ำครวญ, ร้องไห้, เช่น ไทกำสรดสงโรธ ท้ยนสงโกจกำสรวลครวญไปพลาง. (ม. คำหลวง ทานกัณฑ์). (โบ กำสรวญ). One of the key things I learned from this section is why sometimes RID gives the spelling of the original word, like (ข. โปฺรส), and why sometimes it just gives the language, like (ป., ส.). If no spelling of the source word is given, then (so RID claims) the Thai spelling maintains the original spelling. In other words, it's a transliteration from the source language, which is often the case with Pali and Sanskrit words. Mistakes in my counting aside, clearly this is a significant weakness of RID. Point 3 notwithstanding, it often holds that if no connection is certain, no etymological info is given. The (เทียบ X) note is used just over 100 times. Even older but well-known loanwords, like the Thai numbers เอ็ด, ยี่ and สอง through เก้า, which were borrowed from Chinese, are implicitly claimed as Thai. This may have been acceptable 50+ years ago, when the conventional wisdom among Thai scholars was that Thai was a relative of Chinese, but it's hard to excuse nowadays. In addition, to say there are only 400 words from Khmer in Thai is comical, and I'd be surprised if Malay has really had less of an influence than French--even in Bangkok. The English figure above can't be trusted at all, because RID doesn't have an automatic way to distinguish between words which are transliterations from English (e.g. โฮเต็ล) and words which are translated from English (e.g. โทรทัศน์). I'd have to go through and do a manual count to know that. The number of Indic loans, at roughly 10,000 words, makes up 25% of the dictionary's total entries, which sounds reasonable. I'm sure that a relatively small number of these make up more than 25% of actual word usage in Thai based on frequency, however. It's also worth mentioning that many Indic words--or alternate versions of them--came into Thai by way of Khmer, which is ignored in RID. All said, RID is a decent beginning source, if woefully incomplete. Mostly their analysis is simplistic, ignoring how and when a particular word came into Thai, as well as failing to give the meaning of the word in the original language. Oh, yeah. And Happy Valentine's Day! Here's something nice and light today, since it's my birthday (if only for a few more minutes). I think an occasional musician profile will add some more cultural variety to the blog. The first one will be the rock band Silly Fools (ซิลลี่ ฟูลส์). Silly Fools was the first Thai band I came to like, back in aught-two, mostly through sheer virtue of the band's ubiquity at the time. I think the first song I ever heard was the single วัดใจ from their album Juicy, which came out a few months before I arrived in Thailand for the first time. They're not my favorite Thai band, but I still enjoy listening to those singles I "grew up" to Thai pop culture with. For the less rock-inclined, there's also a cover done by high school-age kids for the film Seasons Change. Another earlier track I like is คิดถึง, off their 2000 album Mint. I can only find one copy on YouTube, and embedding is disabled for it. So you can watch it on there, if you like. Sadly, the band as I came to know it is effectively dead. The frontman for Silly Fools, Toe (โต), quit the band in 2006 for religious reasons. In an apparent international crossover attempt a la Shakira or Thailand's own Sek Loso, the band replaced Toe with Benjamin Tuffnell, a Korean-born American singer. The band's new material is now exclusively English. I don't know what they're doing about their back catalog, though, so it seems like a strange choice. There's an ongoing brouhaha in Bangkok over the sign language word for the new Prime Minister, Samak Sundarawej. The new PM, who was officially voted in this past Monday, has complained that Thai sign language interpreters refer to him by touching their nose with a cupped hand. On Thai TV several channels show a little box translating their programs into sign language, particularly during news and talk shows. The man's a little sensitive about the size of his schnozz. Pundits have been duking it out in the media for more than a week now. The interpreters say that the sign isn't new--they've been using this sign for Samak for a long time now. 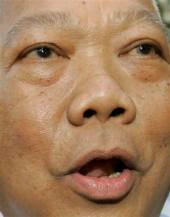 Samak was previously the governor of Bangkok from 2000-2003, and has been a prominent and controversial political figure since he led the anti-communist witch hunts of the 1970s, and used U.S. involvement in the Middle East to justify Bloody May in 1992. He's no stranger to being in the news. Right now I'm sitting here watching a Thai news talk show, and they've got a whole panel of sign language interpreters and deaf Thais on to talk about this. They're pointing out that they make up signs for public figures based on prominent physical features. Samak's nose isn't being picked on (sorry, I couldn't resist). Their explanation makes good sense to me. But known for his sharp tongue and thin skin, it stands to be seen when or if Samak will give up this fight. It's getting a lot of press worldwide, and making rounds on the "weird news" websites. Samak has inadvertently discovered that the Streisand effect applies to more than just the internet. I didn't plan to write reviews for two films by the same director in a row, but that's how it happened. Since I probably won't make it to any movies in the theater any time soon, I'm stuck with what's available on DVD. Today I watched 13 เกมสยอง, a.k.a. 13 Beloved, and now also a.k.a. 13: Game of Death, which will be released on DVD in the U.S. next month. That's right: ชูเกียรติ ศักดิ์วีรกูล (Chukiat Sakweerakul), director of รักแห่งสยาม (The Love of Siam), knows how to do more than make audiences giggle and swoon at teenage boys locking lips. 13 Beloved is an earlier directorial effort of his, from 2006. It never managed to capture my attention before, but based on Wise Kwai putting it in his top 10 Thai films, and because I thought รักแห่งสยาม had a lot of good points, I decided to check it out. 13 เกมสยอง tells the story of ภูชิต Puchit (Krissada Terrence), a band-instrument salesman who finds himself unable to keep up with increasing debt. His car is repossessed the same day an important sale goes sour, after which he finds himself out of a job with a 50,000 baht credit bill, and his mom calling to borrow money in a hurry. After getting a mysterious phone call, Puchit is forced by his dire circumstances into a sick game of 13 challenges, with the promise of a 100 million baht if he makes it to the end. Now that I've seen two films of his, let me say this: Chukiat is another director I'm going to keep an eye on. I'm not in love with any of his work, but much like I said about รักแห่งสยาม, it's well above the average Thai film. Amidst its more serious themes, 13 เกมสยอง has a running comic streak, and some truly hilarious moments that prove how laugh tracks and silly sound effects don't make comedy better. The scene with the "king" at the bus stop was inspired, and the scene with the Chinese family answering (er, not answering) the telephone cracked me up, too. Sometimes the film danced on the edge of the ubiquitous verbal slapstick brand of Thai comedy, but mostly it managed to restrain itself and keep me laughing. The scene in the police station is the main exception, going over the top with shouted insults like a pretty girl who doesn't know how much makeup is enough. After loving the first half, the latter half was a disappointment. Half an hour in, I was saying to myself that this is a great premise worthy of a franchise. At 90 minutes, I began to wonder whether the premise could be rescued from the well it was floating in. It dragged on too long, with an unsatisfying twist. I haven't read the comic it's based on, so I can't compare the two. And I probably need to watch it again to catch the details of the ending, since I watched it without Thai subtitles. Sometimes things fly past me during inattentive moments. But the end felt squandered. This film is not one I'd recommend to someone who had never seen a Thai movie. It suffers from some of the flaws of its numerous and terrible cousins of Thai cinema. Chukiat strikes me as a writer/director in need of a writing partner. If he can find someone to help write his screenplays, I think he could make a real masterpiece. Nonetheless, 13 เกมสยอง was good enough that I told a couple friends about it. And that says a lot. There's some good discussion going on in the comments of yesterday's post about the new version of the online Royal Institute Dictionary, version 0.9. There's another new thing I haven't commented on yet: the visitor counter. 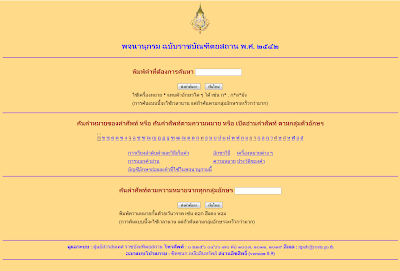 It sits there at the bottom of the page and tells you are ผู้เยี่ยมชม (visitor) number whatever. It debuted late the night of the 7th. The afternoon of the 8th it was around 1700. Right now, not quite two days after its debut, it's at 5336. Of course, it's not counting visitor's at all. It's counting page views, and only of the main page, a very unsophisticated way of measuring traffic. It's a very 1990s-era counter, but at least it's not a cheesy odometer graphic. I'm responsible for a few dozen of those hits, and just now I refreshed about 10 times just to watch the number go up. I hope they're keeping better track on their end of things. I want to tell them about free and excellent tools like Google Analytics. But then maybe traffic stats are considered "official information" unsuitable to trust foreigners with. You no longer get 40 "not found" messages along with your results. Wildcard searching now works like it should, both for queries like ใจ* and *ใจ. Even though large chunks of the text are still missing from the browsable text, you can now find words within those sections, such as ใส่ and ตาม, with the search function. Better than nothing. There's also a new suggestion feature when your query returns no results. I discovered it by searching โหร- and it returned โหร. Turns out there's no entry with a hyphen. Suggestion is a great idea, but my first reaction is that most of the time no suggestion is given. I tested it with various words to see what it suggested. ประเสิรฐ is a simple misspelling of ประเสริฐ, but no suggestion was made. สัญญาน returned สัญญา, but สัญญาณ would have been what I was looking for. เศษฐกิจ returned เศรษฐกิจ, as expected. สัญชาตญาน returned nothing. The correct spelling is สัญชาตญาณ. เหรียน returned เหียน, but I was hoping for เหรียญ. This feature isn't doing so well in my tests--all of which should have been very easy for it. There's a lot they could do to easily improve this feature. Like swap out similar consonants for each other, for example. If it did that it would pass pretty much all of my tests. It's probably using a fancy mathematical similarity rating, when a common sense approach to detecting spelling errors would be effective in most real-world scenarios. Another thing: suggestions are only given when no result is found for your query. Sometimes you can't find the right spelling for the word you want, but your misspellings coincide with other real words (like the time I just couldn't seem to find the right spelling of ปรอท [ปะหฺรอด]). It would be nice to see similarity suggestions as an option for all queries. There are other new "features", too. Beyond fixing the simple asterisk wildcard search, there are also plenty of unadvertised ways to search, if you're familiar with some basic regular expression notation. Some of this worked before, but I'll try to cover it in more detail later. All said, this is a nice little upgrade for RID99 online. RID online gets a facelift: new/fixed features in store? Prior to now, no version number was given. I've covered the new online version of RID99 (so-called by me because it corresponds to the 1999 print version) extensively since its release last June, particularly focusing on usability issues and other ways it's not meeting its electronic potential. [See here, here, here, and here.] I sent some feedback by email to the address given on the site shortly after the new dictionary showed up online, but got no reply and never saw my suggestions implemented. A couple of weeks ago, I had the chance to visit the Royal Institute, and while this wasn't the main purpose of the trip, I took the opportunity to pass on a list of issues that I had prepared and printed. I hoped it would be received in the spirit of constructive criticism that I intended. I'm not going to go so far as to claim any direct connection between this site update and my suggestions (or my nagging, depending on how you look at it). But if this makeover on the site means we can expect improvements soon (like, in the morning, I hope), then at least I know they're still developing the online tool. It's gratifying to see it get better, regardless. In fact, at least one of the issues that I originally wrote about has been fixed: even though the browsable full-text version of the dictionary is still missing large chunks from the letters ต and ส, you can now search words from the missing chunks and get results. This wasn't the case at first. Progress has been slow in coming, but it looks like we might be getting there. I'll have a full report of any changes I can find after it's fully operational again. Stay tuned. I found another fun connection today. If you've read my post about the Indic names of the compass directions, you will remember that the four major compass points are บูรพา /burapha/ 'east', ปัจฉิม /patchim/ 'west', อุดร /udɔɔn/ 'north', and ทักษิณ /thaksin/ 'south'. Another meaning for these four words is (in the same order) 'front', 'back', 'left' and 'right'. 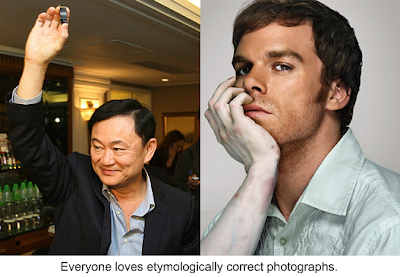 The word ทักษิณ comes from the Sanskrit daksinah 'on the right hand, southern, skillful.' What I learned today that I'd never known before was that dexter also means 'on the right hand, skillful' (its etymological opposite is sinister). After the initial spark of intuition, some quick checking shows that these are indeed etymological cousins, both descended from the Proto-Indo-European root *dek-. ก๊อปปี้ [kɔ́ppîi] = v. to copy, duplicate; n. copy; clf. copies (of a document); adj. duplicate. Also spelled ก๊อปปี, among other variants. Note the short vowel on the first syllable. This gave rise to the clipped form ก๊อป [kɔ́p]. Both forms are used in a variety of senses. ซีดีก๊อป refers to bootleg CDs, like copies made in a CD burner; ก๊อปปี้เซ็นเตอร์ is a copy center, and ถ่ายก๊อปปี้ means to make a photocopy; in the classroom, ก๊อป means to to copy someone else's work, as in in ก๊อปเพื่อน 'to copy off a friend'. I had no idea this word has been around in Thai for so long. This shows that its original borrowed sense was to make a handwritten copy. The native word for this is ลอก or คัดลอก. ก๊อปปี้ retains this sense today, along with newer more technologically advanced meanings. ซี [sii] = to photocopy. Clipped from 'Xerox'. 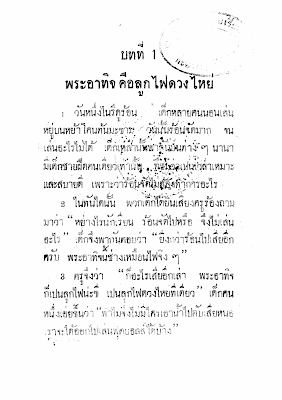 The full name, ซีรอกซ์ [ซีหฺร็อก], is also used. Note that like many English loans, the Thai pronunciation doesn't follow regular tone rules. Usage follows the pattern of English, which also uses Xerox as a generic verb meaning to photocopy (regardless of the brand of machine). This is the word I hear used by students and photocopy staff at the two libraries I frequent most, Chula Library and the National Library. Another interesting thing is that you can use either ก๊อปปี้ or ซีรอกซ์ with the verb ถ่าย: ถ่ายซีรอกซ์ or ถ่ายก๊อปปี้ (the formal Thai is ถ่ายสำเนา), but the clipped forms are usually used as verbs by themselves. ซี is equivalent to ถ่ายซีรอกซ์, and ก๊อป is equivalent to ถ่ายก๊อปปี้. ปั๊ม [pám] = to pump; to stamp; to make a copy. From English 'pump', typical uses include: ปั๊มน้ำมัน 'gas pump' (referring to the entire filling station), เครื่องปั๊มน้ำ 'water pump', ปั๊มหัวใจ 'to perform CPR' (i.e. pump the heart). But there are other meanings that stray a bit further from the English source. ปั๊มเอกสาร means 'to stamp a document', as with a rubber stamp or an embossing seal, and ปั๊มตรา 'affix a seal' means the same thing. Presumably this comes from the motion of 'pumping' the lever of a old school desk embosser. Finally, ปั๊ม also means to copy or press a professional-style compact disc, complete with data and artwork; a disc press is เครื่องปั๊มแผ่น. I wish there were more used bookstores in Thailand. I mean that in both senses--stores that sell used books, and bookstores that are used (by the reading public). I wish there were more bookstores, period. Mostly what passes as a bookstore here I consider a glorified magazine rack. I wish they could all be like the Chula Book Centre, or the Prae Pittaya at Central Lat Phrao. But even the larger Dok Ya and Se-Ed branches aren't so bad. 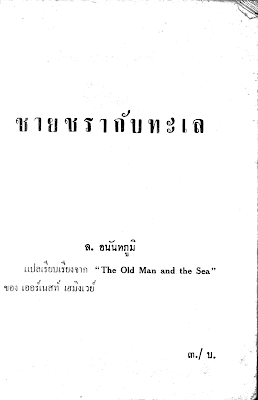 This is ชายชรากับทะเล, a 1957 first printing of Hemingway's The Old Man and the Sea, translated into Thai. If you're counting, that's just five years after the original English was published, which won a Pulitzer Prize in 1953 and a Nobel Prize in 1954. This would have been pretty hip literature back in 1957 Thailand. This version is called เฒ่าผจญทะเล, a less literal title translation than its predecessor, but maybe more interesting to the Thai ear.